Apple has announced the fifth-generation iPad as “iPad Air,” with lot more thinner design profile. The all-new iPad Air is now featuring an A7 Processor chip, and as well as 9.7-inch Retina display screen. The new iPad Air design profile takes high-end iPad series to 7.5mm from 9.4mm. 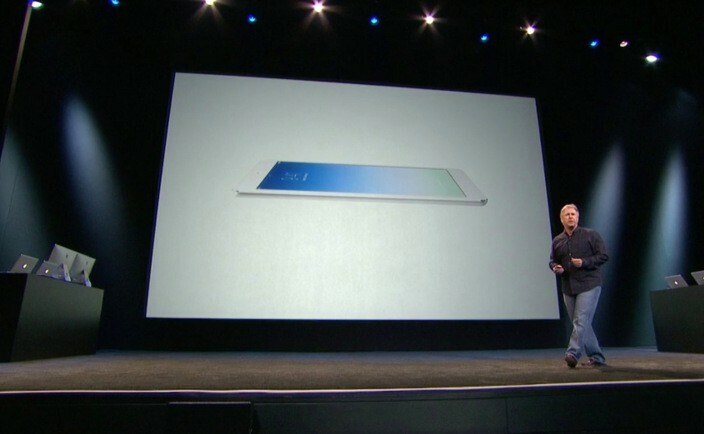 iPad Air is 20% thinner across the entire devices, and carrying a powerful 64-bit processor provide real processing. The new iPad Air weighs 1 pound only, and the new device is focusing only on the overall improvement of device. It provides 2x Graphic rendering on screen than older iPad series. Apple has updated entire inner components of iPad 5 with replacing older generation WiFi technology with new antennas, which are fast as twice than older generation. iPad Air is carrying a 5 Megapixel front-camera for real HD FaceTime, and dual-microphones to provide an iPhone like audio quality. The iPad Air has not received any update in Battery section, and it is still offering 10 hours of battery life backup to iPad lovers. iPad Air comes in two colors variants, which means there is no gold iPad Air for users in Arab areas. The iPad Air comes in the combination of White/Silver, and Black/Space Grey. The price ranging of iPad Air WiFi variant starts from $499, while the Cellular version is containing a price tag of $629. SAN FRANCISCO—October 22, 2013—Apple® today announced iPad Air™, the latest generation of its category defining device, featuring a stunning 9.7-inch Retina® display in a new thinner and lighter design. Precision-engineered to weigh just one pound, iPad Air is 20 percent thinner and 28 percent lighter than the fourth generation iPad®, and with a narrower bezel the borders of iPad Air are dramatically thinner—making content even more immersive. Apple today also announced iPad mini with Retina display, bringing all the pixels from the 9.7-inch iPad to its 7.9-inch screen, delivering razor sharp text and detail in the same amazingly thin and light design. The new iPads feature the powerful and power-efficient Apple-designed A7 chip with 64-bit desktop-class architecture, ultrafast wireless with faster built-in Wi-Fi and expanded LTE cellular connectivity, and the newly-designed iOS 7 featuring hundreds of great new features. New custom-designed polyurethane Smart Covers for iPad Air and iPad mini with Retina display will be available for $39 (US) in a range of vibrant colors, including blue, green, pink, yellow, black and (RED). iPad Air Smart Cases and iPad mini Smart Cases are completely redesigned in a beautiful aniline-dyed leather available in six rich colors, including beige, black, blue, brown, yellow and (RED) for a suggested retail price of $69 (US). Smart Covers and Smart Cases are available through the Apple Online Store(www.apple.com), Apple’s retail stores and select Authorized Apple Resellers. iPad Air and iPad mini with Retina display will be sold through the Apple Online Store(www.apple.com), Apple’s retail stores and through AT&T, Sprint, T-Mobile, Verizon Wireless and select Apple Authorized Resellers. Starting on November 1, iPad Air will be available in the US, Australia, Austria, Belgium, Bulgaria, Canada, China (Wi-Fi models only), Croatia, Cyprus, Czech Republic, Denmark, Estonia, Finland, France, Germany, Greece, Hong Kong, Hungary, Iceland, Ireland, Italy, Japan, Latvia, Liechtenstein, Lithuania, Luxembourg, Macao (Wi-Fi models only), Macedonia, Montenegro, Netherlands, Norway, Poland, Portugal, Puerto Rico, Romania, Singapore, Slovakia, Slovenia, Spain, Sweden, Switzerland and the UK. At Apple retail stores in these countries, iPad Air will be available beginning at 8 a.m. local time on Friday, November 1. ¹Battery life depends on device settings, usage and other factors. Actual results vary. ²Based on theoretical speeds, actual speeds may vary. ³LTE is available through select carriers. Network speeds are dependent on carrier networks. Check with your carrier for details. ⁴iTunes Radio is available with iOS 7 in the US.